Width of a Post pundit members Katie Whyatt, Gareth Walker and Phil Abbott provide their assessment of Saturday’s 1-1 draw with Colchester United, plus reflect on whether they believe Bradford City can stay in the play off hunt, and whether doing so is more important than the cup. What did you make of Bradford City’s performance? Gareth: City started very poorly. Most City fans would tell you that it was nailed on that we would struggle against Colchester after the heights of last week. In truth we could have been two or three nil down before we even got going. I agreed with Phil Parkinson’s post match comments that Andrew Davies and Rory McArdle gave Chris Porter far too much time early on and we were punished. After the first 25 minutes though, I thought that we were the better side. Sadly, the pitch was not conducive to a team who had to force the issue and chase the game. The positives were that we stuck at it and forced our way back into the game. We didn’t test their keeper enough, but towards the end of the game I thought that had we scored ten minutes earlier then we could have gone on and got the three points. 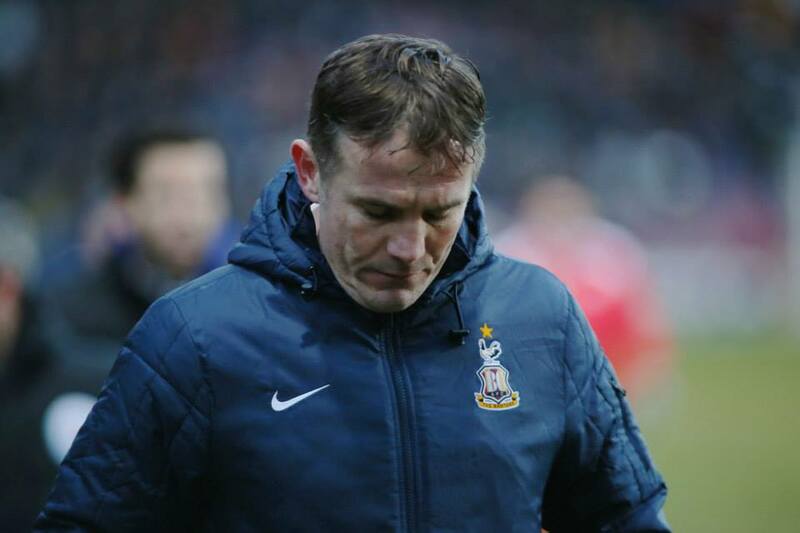 Katie: Definitely a game of two halves, but probably understandable given what preceded Saturday and the condition of the pitch – which Phil Parkinson condemned in his post-match interview and deemed unfit for a professional game. I thought City looked uncomfortable initially, especially the centre backs and central midfield. Colchester had Porter up front, Gavin Massey dropping off and Sammie Szmodics supporting extensively from the middle of the park; attacking with a fluidity and an intent that often overran Davies and McArdle. Colchester got forwards quickly and attacked with purpose – credit to them for that. It wasn’t at all a smash and grab performance from them. We were better in the second half, and, on the whole, I felt there were a number of decent performances. James Meredith was key for me; Jon Stead was a class act, as ever; Filipe Morais too. The manner the team started the game was disappointing, but the discipline required to surmount the gap and come from behind bodes well for the visit to Port Vale. Phil: By the time Andrew Davies jettisoned the concrete in his boots, the damage was done. In truth, the early damage could have been much greater in goal terms, but psychologically, City had been scarred by Colchester’s pace on the boggy surface. Any thoughts City might have had about forcing the game with sweeping attacking sorties was tempered by both the knowledge that the U’s had pace to burn on the counter-attack and that the field was far from conducive to free-flowing passing football. Whilst the comeback was gutsy, the largely one-dimensional approach from both sides led to a frustrating afternoon. City are still in the play off hunt. Do you think they can stay there? Katie: Yes we can stay there. I think this division is wide open and those final two spots are anyone’s. Any top half to mid-table team should be looking to close that gap and mount a good play off challenge – we are no different. I worry over our consistency – we have turned a huge corner since the start of the season, with the second half at Halifax seemingly the watershed moment that set in motion this successful run – but results like Saturday and against Yeovil demonstrate how random and unpredictable football can be, for all there are mitigating circumstances for both. Inconsistency blights most of the teams challenging us for fifth and sixth, though. I worry about depth but believe we can sustain this run nonetheless. Phil: Whilst I’d like to think on our day we could beat any team in the play offs, over two legs we may well not be able to find the consistency required. Because of this, I’m not sure we are quite ready for a play off push and expect we are about as high at the moment as we are going to be, come the end of the season. Of course, I hope I’m wrong, but we’re going to have to string some very good results together now the fixtures are coming thick and fast. Gareth: I’m a pessimist or a glass half empty man, so I’d have to say no. I don’t think that the squad is big enough to cope with the hectic two-games-a-week schedule that we have coming up. The league is very tight all the way down, and out first aim has to be to get to that magic 50 point mark. Katie: I think the play off question is an interesting one. As I said, I never viewed this as the promotion season, but I’d just like us to remain in the hunt for as long as possible. As Gareth said, the manic schedule for the next few weeks and the consistency of the squad makes it hard to decide, but – and criticise me for being so blasé and abandoning my my ‘best chance to get promoted’ mentality from earlier – how much would it matter? We have a young squad with players that are entering their peaks. We had a difficult first few months, but have hit the ground running now. Provided we can keep Stead, there is no reason we cannot challenge next year – the longevity is there. That’s not me writing off the season and saying they won’t do it – I think they could make the top six – but it’s not the be-all and end-all, if that makes sense. But I worry next year could easily become a make-or-break season if it remains the final year on Parkinson’s contract. I’m not sure how I feel about that. What’s more important to you – the league or the cup? Katie: I asked myself this on the way back from the ground on Saturday, and didn’t really come to a conclusion. The thing is: I’m viewing this through an odd lens. I would have been happy with a mid-table finish this year, having anticipated another year of consolidation, and, early doors, that looked what this season was set to provide. When the team began to pick up momentum, only then did I start to think of the top six. I’d probably say the league. I think promotion – or even just staying in the mix right until the death – would probably entail greater benefits, long-term, for the club. My underlying fear is that this is our best chance to obtain promotion, even if most members of the squad have contracts that run beyond this year. Were we to miss out, I’d worry we’d blown our best shot. And this sentiment obviously contradicts with my outlook at the start of the campaign. Ergo: Katie = confused. Phil: With my expectations as they are, I think the priority might actually lie in the cup at this stage, as securing a win into the next round will create a financial injection that a good run of league form would struggle to match. Don’t get me wrong: I want us to win every game we play! Gareth: For me it’s always the league. That’s the bread and butter. The cups are a bonus, because we won’t win one. This is even more the case now that we have made some money out of the cups this season. Having said that, I think we have a chance against either Sunderland or Fulham and I wouldn’t rule out the cup run continuing for a while yet, so I’ll be enjoying it.